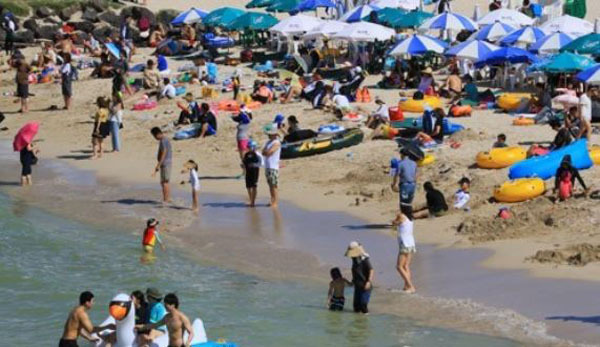 Nearly a quarter of salaried workers in South Korea did not use their vacation time from August 2015 through July of last year, a report by a local culture and tourism organization said Monday. The findings, based on a survey of 4,357 people nationwide by the Korea Culture and Tourism Institute, showed 23.9 percent of those checked said they did not use their vacation time. The lack of free time was reflected in South Koreans putting in some of the longest work hours in the world at the time the survey was being made. South Koreans worked an average 2,113 hours annually compared with 1,766 hours on average for all member states of the Organization for Economic Cooperation and Development, 2015 OECD data shows. The country's labor law limits work hours to 52 hours a week, but employees actually can work up to a maximum 68 hours, if they show up at their jobs on Saturdays and Sundays. Workers at the agriculture and fishery industry topped the list of those who did not have vacation with 74.2 percent, followed by manual laborers at 57.3 percent, those working for the machinery and equipment industry dipped to 35.8 percent and soldiers at 35.4 percent. Professional workers were the group who enjoyed vacation the most, with 87.9 percent having taken time off, trailed by office workers at 85 percent, managers at 84.7 percent and sales personnel at 77.1 percent. The average vacation period was 5.9 days, with 48.4 percent of those surveyed having fewer than five days of vacation. About 33.6 percent had a vacation period of five to nine days. Only 16.3 percent had a longer holiday period between 10-19 days, with just 1.7 percent having more than 20 days off for vacation. About 3.78 days of vacation was spent during the summer, while 0.83 and 0.48 days were spent for autumn and winter, respectively. Sightseeing was the most popular activity for vacationers at 30.6 percent, while 26.5 percent went camping, 19.6 percent visited hot springs or beaches and 19.1 percent spent their free time shopping and dining.